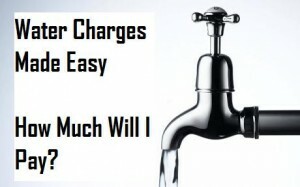 Back in May based on the information to hand at the time from the Commission of Energy Regulation we put together a report on water charges and what each household is likely to pay. Detailed report with full breakdown of charges plus loads of water saving tips now available to view here. This was during the run up to the local elections and we were using a figure of 0.0022 (€2.20 per 1,000 litres) to make our calculations. However three months later it now appears that the cost per litre will be over double what we thought it would be. We now estimate that one adult living by themselves will pay over 270 euro per annum, a family with three children will pay over €1,200 and a five adult household over €1,500 per annum. If you have a private well or your own septic tank this figure is halved to €2.24 per 1,000 litres. There is more bad news for Irish householders in that the previously proposed 38,000 litre annual allowance per child is now reduced to just 21,000 litres per annum. (58 litres per day). We estimate that this would not even cover an average five minute shower per day. It would appear that based on the below figures the longer you don’t have a meter the better off you will be. How does this affect our water charge estimates? In our May report we predicted that a one adult household would pay just under 125 euro per annum when the home is being meter charged. We now estimate that unless you have a private well or septic tank this figure will be over 270 euro per annum. If you have a septic tank or private well the figure will be still over 135 euro per annum. Our figures are based on the following.